Joyfully Becca: I'm a milkmaid! Rory built the milk stand early this spring. And then life picked up and one night he told me, "we can't milk Darcy. We just have too much going on to add that into the mix." And I agreed, but we were bummed. We have been waiting and wanting to milk her for a long time. But I knew this was probably the best and wisest decision. But then the next day he said, "we just have to!" And I said, "I know!" Saturday morning was our very first morning. 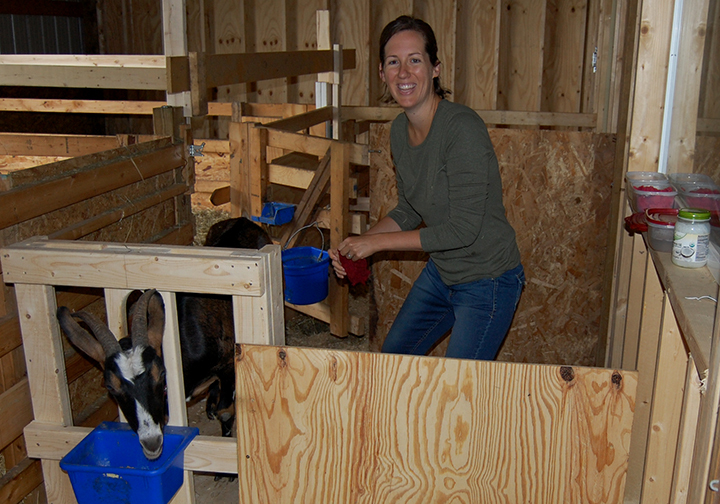 We put the two goat kids into a separate pen each night at 8pm. Then at 8am we head out and milk Darcy who is ready to be milked. And when we're done, she lets down a second round of milk for her goat kids and they are reunited all day long until 8pm. It means we only milk once a day, which is really great. This was my face on Saturday morning before we began. And while milking. And after milking. I just took to this new pastime with so much joy! I love milking Darcy! It is awkward. And I have to tell my pinky to pitch in nearly every time. There is a definite knack to hand milking. But Rory is super impressed with my progress and I am so happy to have this farm chore added to my morning routine. I was actually pretty fast this morning, my third morning ever! Plus, I love Darcy. If she was a human, we'd be great friends. She's so good to me. A little stomping at first, and the first day she got her hoof right in the bucket. But I don't blame her. She will turn her head back in the stand and make eye contact with me like, "what on earth are you up to back there?" But she's patient and I tell her she's such a good goat. And she let's me keep working. This was my first day's milk, and we didn't actually drink this stuff because of the whole hoof-in-the-bucket thing. But the past two days have been clean! I bring the milk in the house and filter it with a coffee filter into my mason jar. Then I put that jar right into an ice water bath for an hour to chill as quickly as possible. I read that the faster you chill your milk the less goat-y it will taste. After church on Sunday we all had a glass together. And guess what? We loved it. All Groves were in agreement. 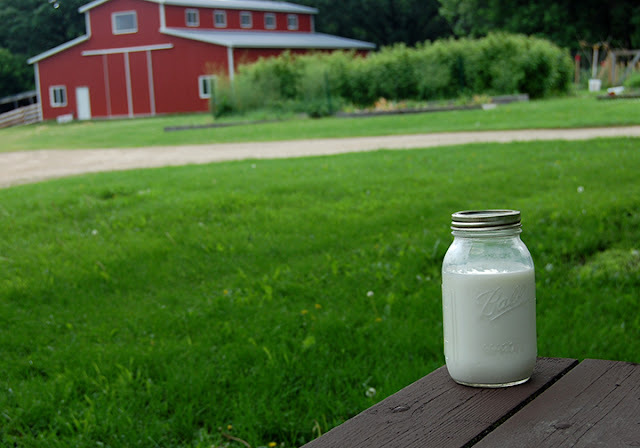 We couldn't actually tell a difference between this milk and cow's milk. And then it had added points of goodness from "fresh from our farm." That always excites us so much.